The May 31 hold-down firing of the Antares rocket’s two new RD-181 engines was a key step in preparation for the cargo booster’s return-to-flight, which Orbital ATK then said would occur in July with a Cygnus supply ship heading to the International Space Station. Managers from Orbital ATK and NASA, which manages the schedule for the space station’s U.S. cargo vehicles, set a preliminary launch date of July 6. An Orbital ATK spokesperson said engineers are analyzing data from last month’s 30-second hotfire test on the Antares launch pad at Wallops Island, Virginia. 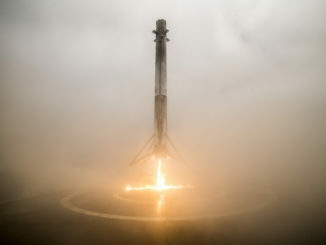 In conjunction with the data crunching, the company’s engineers are also adjusting the trajectory the two-stage rocket will fly after blastoff from its seaside launch complex. The 139-foot-tall (42.5-meter) rocket, propelled by two RD-181 engines on its first stage and a solid-fueled Castor 30XL upper stage, will deliver Orbital ATK’s Cygnus cargo craft to orbit. 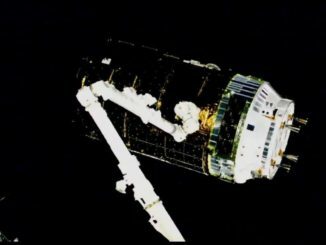 The automated supply freighter, named the SS Alan Poindexter after the late space shuttle astronaut, will carry approximately 5,290 pounds (2,400 kilograms) of provisions, experiments and other cargo to the International Space Station. 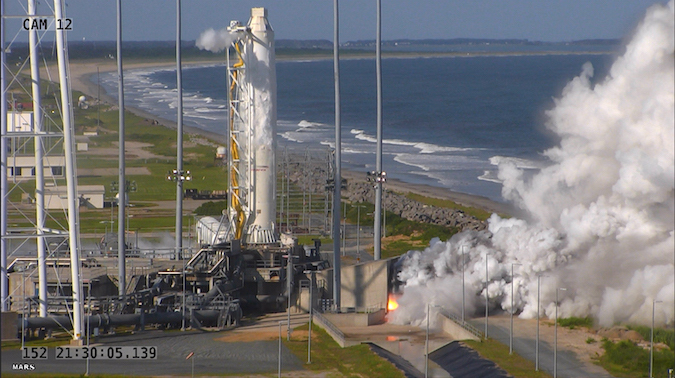 Orbital ATK switched to a new first stage engine after an Antares booster crashed seconds after lifting off in October 2014, destroying the rocket and its payload heading for the space station. Investigators faulted a liquid oxygen turbopump in one of the rocket’s two AJ26 engines for the mishap. The AJ26 engines were manufactured in Russia in the 1970s for the Soviet Union’s ill-fated N1 moon rocket. Called NK-33 engines in Russia, the propulsion units were imported to the United States in the 1990s by Aerojet Rocketdyne, which modified the engines and renamed them the AJ26. Officials sped up already-existing plans to replace the troublesome AJ26 engines with newly-built RD-181 powerplants acquired from NPO Energomash, a top Russian rocket engine contractor that also provides the RD-180 engine for United Launch Alliance’s Atlas 5 first stage. The RD-181 engine is more powerful than the AJ26, adding to the Antares rocket’s lift capability. It also burns the same kerosene/liquid oxygen propellant mix, simplifying changes to the Antares first stage and the Wallops Island launch pad. The May 31 hotfire test ran the two RD-181 engines through a typical flight profile, commanding the first stage propulsion system to hit several throttle settings the engines will see during launch. The RD-181 engines will fire for about three-and-a-half minutes in flight, more than 20 seconds shorter than the AJ26 engines burned on the earlier Antares design. The extra power provided by the RD-181 engines will drain the first stage propellant tanks in shorter time. 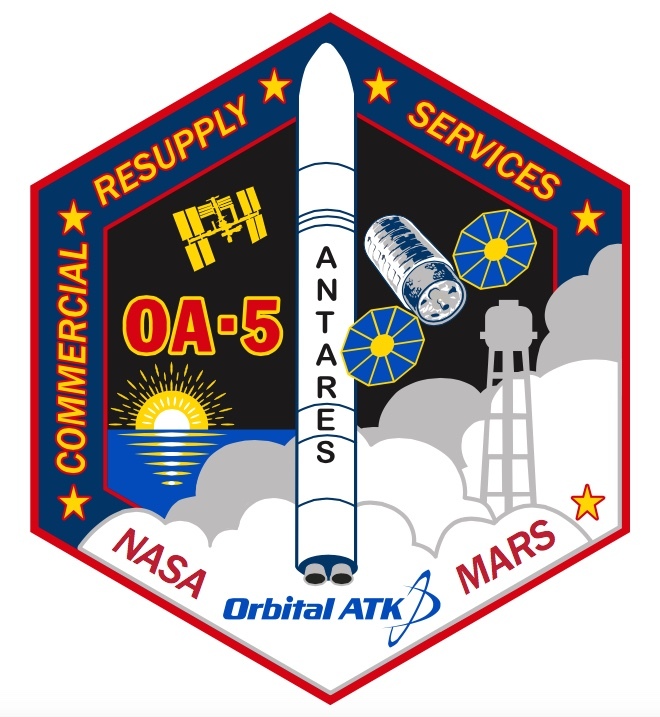 The upcoming Antares mission, dubbed OA-5, is the sixth of 11 operational space station cargo flights contracted to Orbital ATK by NASA, including a bonus mission awarded through a contract extension earlier this year. Orbital ATK is also guaranteed at least six cargo delivery flights through 2024 under a separate follow-on contract announced in January. The last two Cygnus flights took off aboard Atlas 5 rockets from Cape Canaveral. Orbital ATK purchased the two Atlas 5 launches from ULA to keep the Cygnus supply ship flying while the Antares rocket was grounded. Orbital ATK has two space station cargo flights on its manifest before the end of the year, including the return-to-flight mission in August. “A final decision on the mission schedule, which takes into account the space station traffic schedule and cargo requirements, will be made in conjunction with NASA in the next several weeks,” Orbital ATK said in a statement. 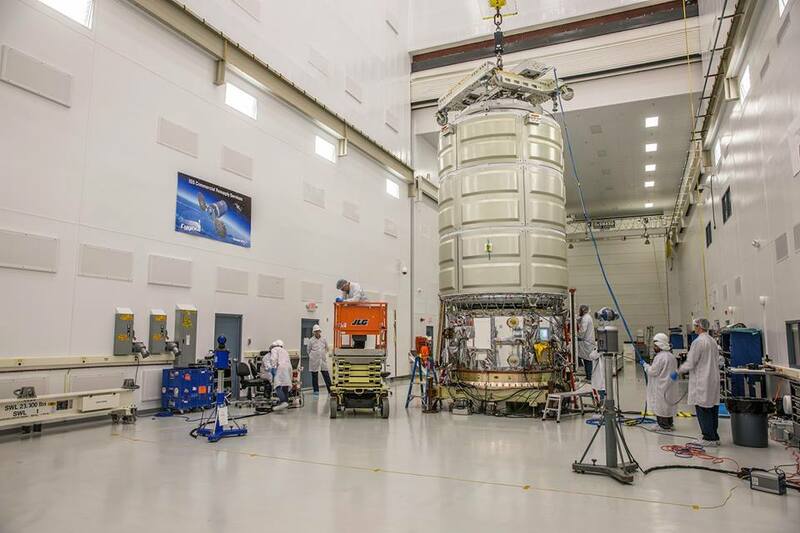 Launch preparations for the Cygnus spacecraft completed recently include the attachment of its pressurized cargo module, made by Thales Alenia Space in Italy, with a service module manufactured at Orbital ATK’s headquarters in Dulles, Virginia. 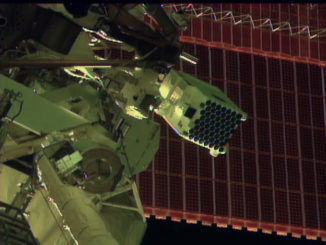 Technicians have also installed the initial cargo load into the Cygnus cargo carrier.